There are currently over 330 described dinosaur species and this number is growing. This, of course, is only a sample of all the different kinds of dinosaurs. Although the small flesh-eating dinosaurs were diverse and dangerous, Cretaceous Alberta was ruled by members of the family Tyrannosauridae. All tyrannosaurs had hind legs that were long and powerful, with each hind foot having three toes ending in enormous claws. 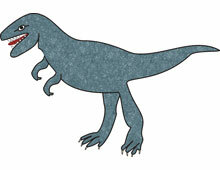 The two-fingered front limbs were small, not much larger than a mature human arm. The function of the front limbs is not known; they are too short to have passed food to the mouth. There Albertosaurus, the "Alberta lizard" was among the more fearsome predators in Cretaceous Alberta. Almost 10 metres long, it is the most common of the large carnivores found here. Smaller but longer-limbed than Tyrannosaurus rex, Albertosaurus would have been a mobile hunter, although it probably fed on the carcasses of already dead animals as well. Although over eight metres in length, three metres high at the hip, and weighing more than two tonnes, Albertosaurus may have been capable of attaining speeds of up to 40 kilometres an hour. This fleetness, combined with obvious physical strength, would have made Albertosaurus a fierce hunter, perhaps even more so than the more massive Tyrannosaurus rex. Albertosaurus' neck was strong and muscular, supporting a large but lightly built head. The teeth were long and recurved with saw-like edges, perfect for tearing flesh. They were not adapted for chewing, make it likely than Albertosaurus, like most modern reptiles, swallowed flesh in large chunks.